Owned by the Town of Mendon, Meadow Brook Woods is a property just north of Cormier Woods. I was joined by a few friends for this first of two hikes in the area. We started from the north entrance along Park Street and followed the trail into the property. We soon came to a cabin on the right. We followed the trail ahead of us and soon started to see the orange blazes. We continued along the trail through the pines and passing stone walls. We were looking for the orange loop, but it seems that the trail is being worked on. We then came to the white blazed trail and followed that, first crossing the Meadow Brook over a new bridge. Our hike was cut short though when we approached Wigwam Brook. A new bridge is being built, however, at the time of this hike it was not passable. I plan on hiking Cormier Woods in the future, therefore I will hike this trail again when the improvements are finished. At this point we had hiked about a half mile. There was the first snow cover of the season on the ground. This spot along the Wigwam made for a great photo opportunity. From here we retraced our steps back to the car stopping briefly to check out the ruins of an old outhouse. Although I saw no wildlife, I did see several animal tracks. Trail map can be found at: Meadow Brook Woods. 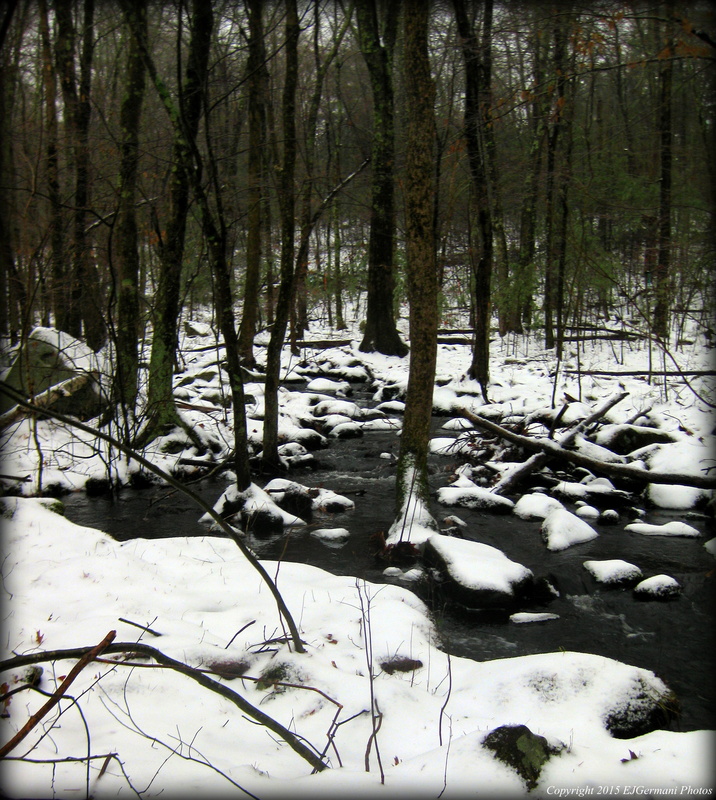 Wigwam Brook After A Snowy Night.